From the example of the sunset picture in installment #1 of this photography basics series, you have learned the importance of taking full control over the exposure on your camera. Now, it's time to dig into your camera and learn the three most basic tools available to you in controlling the exposure. Those tools are shutter speed, aperture, and ISO. After I explain what each one does, I'll explain why we need three separate tools to control the brightness or darkness of the photo. A small aperture in a camera lens. The aperture is a small set of blades in the lens that controls how much light will enter the camera. The blades create a octagonal shape that can be widened (we photogs call it shooting “wide open”), or closed down to a small hole. 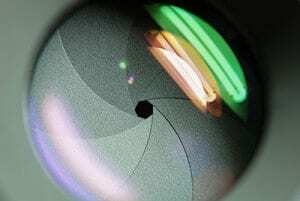 Obviously, if you shoot with the aperture wide open, then more light is allowed into the camera than if the aperture is closed down to only allow a tiny hole of light to enter the camera. So suppose you take a picture that is too bright. How do you fix it? Simply choose a smaller aperture. Simple! Aperture sizes are measured by f-stops. A high f-stop like f-22 means that the aperture hole is quite small, and a low f-stop like f/3.5 means that the aperture is wide open. Let's test your knowledge to make sure you have it down. If you take a picture and it's too dark at f/5.6, would you choose a lower f-stop number or a higher one? Yep! You'd choose a lower f-stop number, which opens up the aperture to let in more light. The size of the aperture controls more than the brightness or darkness of the picture, though. The aperture also controls the depth-of-field. Depth-of-field is how much of the picture is sharp, and how much is blurry. If you want to take a picture of a person and have the background be blurry, you'd use shallow depth of field. If you want to take a picture of a sweeping mountain vista, you'd want to use a small aperture size (high f-stop number) so that the entire scene is in sharp focus. If you, like me, are more of a visual learner, then I think this graphic will help solidify the information about aperture. Take a minute and make sure you understand this info before moving on. The shutter is a small “curtain” in the camera that quickly rolls over the image sensor (the digital version of film) and allows light to shine onto the imaging sensor for a fraction of a second. The longer the shutter allows light to shine onto the image sensor, the brighter the picture since more light is gathered. A darker picture is produced when the shutter moves very quickly and only allows light to touch the imaging sensor for a tiny fraction of a second. The duration that the shutter allows light onto the image sensor is called the shutter speed, and is measured in fractions of a second. So a shutter speed of 1/2 of a second will allow more light to touch the image sensor and will produce a brighter picture than a shutter speed of 1/200 of a second. So if you're taking a picture and it is too dark, you could use a slower shutter speed to allow the camera to gather more light. That's me! Typing away on this article from my studio in Meridian, Idaho. Just as the aperture affects the exposure as well as the depth-of field, the shutter affects more than just the exposure. The shutter speed is also principally responsible for controlling the amount of blur in a picture. 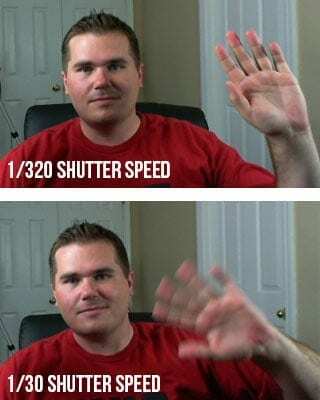 If you think about it, it makes sense that the shutter speed controls how much blur is in the picture. Imagine me sitting here at my computer desk waving to you (you don't have to imagine very hard if you just look at the picture on the right).If you take a picture of me with a shutter speed of 1/30th of a second, then my hand will have moved in the time that the camera is recording the picture. To get rid of the blur, you need to increase the shutter speed to around 1/320th of a second. At this speed, my hand is still moving, but the camera takes the picture so fast that my hand travels only such a small distance that it is not noticeable in the picture. The next question that most people ask is, how slow of a shutter speed can you use and still get a sharp picture? Click here for a blog post that answers that exact question. The funny thing about ISO is that it is an acronym, but nobody really knows what it stands for. It is always just called ISO even though it really stands for International Organization for Standardization. Every once in a while, you'll hear an older photographer pronounce it “I-so”, but almost everyone pronounces it “I.S.O.” The ISO controls the exposure by using software in the camera to make it extra sensitive to light. A high ISO such as ISO 1,600 will produce a brighter picture than a lower ISO such as ISO 100. The drawback to increasing the ISO is that it makes the picture noisier. Digital noise is apparent when a photo looks grainy. Have you ever taken a picture at night with your cell phone or your pocket camera, and noticed that it looks really grainy? That is because the camera tried to compensate for the dark scene by choosing a high ISO, which causes more grain. What constitutes a “high” ISO is constantly changing. Camera companies are constantly improving the ability of cameras to use high ISOs without as much grain. A few years ago, only the highest-end pro DSLR cameras could achieve 2,000 ISO, and now even entry-level DSLR cameras can shoot at this level. Since each camera is different, you would do well to do a few tests with your camera to see how high of an ISO you can shoot at without making the image overly grainy. Right now, you will commonly find new DSLRs that advertise expandable ISO ranges. To learn more about that, click here. I know exactly what you're thinking: “Why do I need three tools to control the exposure!?!? Wouldn't one suffice?” The answer is no, and I'll explain why with an example. In January 2012, I took a trip to my favorite place on the planet to take pictures–Yellowstone National Park. My guide informed us that the bighorn sheep in the park were dying off very quickly due to whooping cough, so I worked hard that week to capture pictures of the last few sheep in that area of the park. Around 9AM on a cloudy day, I found a small group of bighorn sheep and started photographing them with a long 600mm lens. The early hour and clouded sky made the situation quite dark for shooting. The lens I was working with (which costs $11,000–don't they know I've gotta send my kids to college? )… Anyway, it had a maximum aperture size of f/4. So I set my aperture at f/4 to gather as much light as possible. 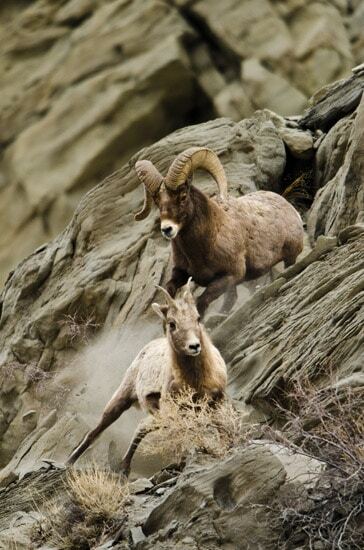 This also impacted the depth-of field to blur out the rocks behind the bighorn sheep. Next, I set my shutter speed. I wanted to capture action in the photo, so I set my camera to 1/1000th of a second shutter speed. I knew that this fast of a shutter speed would prevent any motion blur from the sheep running on the mountain side. Then, I took a picture. WAAAY too dark! I couldn't compromise my shutter speed or aperture, so I knew I needed to use the third player in the exposure triangle–the ISO. I played around with my ISO and found that if I increased it to ISO 640, it made the picture bright enough to take the picture without making it overly grainy. Yahtzee! This combination of shutter speed, aperture, and ISO worked out perfectly. Now can you see why you need to know how to shutter, aperture, AND ISO, and know how to set them independently on your camera? Click the link below to continue reading this totally free photography basics series of articles, but if you're more of a visual person and want to see how to set the camera settings for various situations, you should really check out Photography Start. If you're a visual learner and want to really learn your camera, then be sure to check out my beginner photography class, which I call Photography Start. It's a series of 22 short videos where I take you on location to shoot waterfalls, landscapes, people, kids, and macro photos. You can look over my shoulder and see exactly how I set up my camera to take professional photos. Best of all, the video series is priced REALLY reasonably at just $15. Check it out here. In part 3 of the Photo Basics Series, I'm going to teach you how to set these on your camera. Now i get it….!!! how did you teach me that?? Thank you very much for basics.. learn lot ! WHAT AN ARTICLE!! this is so far, hands-down the best guide i could possibly find. It has been put very creatively simple that a layman like me could understand every single jargon with ease. I love the graphic examples and they are very immensely helpful. Thank you so much for your outstanding work and time to help people like me new to this exciting journey. have not found out about anywhere else, Also your information is so simple and easy to follow. Jim, you are great. I got into photography about a year ago and I was able to pick up very quickly on these above mentioned settings but I don’t get some of the negative picky comments people make. You’re a nice guy who is doing something you love and have passion for and you are sharing it with us. Thanks and keep up great work! I love your podcast so please don’t take too long in between them episodes! I get withdrawals! Thanks! thank you for the info’s.. I was very confused initially dat wat those terms actually meant.But after reading your article,things are very clear in my mind.Now i’m pretty confident about taking a perfect shot. Made everything a lot easier but my camera doesn’t have shutter speed. I was told that with my camera, my shutter is my ISO. How can I distinguish between the 2. Are they proportonal? I have had a DSLR for a while now but could never get my head around ISO, Aperture and Shutter Speed. I read many articles but found them complicated and confusing. But your article has put it so simply, especially with your visual graphics, I have actually u dear stood these three elements. So, thank you very much for the article. For the longest time, I could NOT figure out how to put those three together. I knew what each meant but it was very difficult to figure out how to put them all together. Your article was very helpful. Thank you! So much details with such simplicity. Thanks for all the info. Very helpful article for complete beginners. Thank you so much..
Great set of articles you have made a complicated subject easy to understand. Thanks for this tutorials. Simple to read, its giving me more interest to read. Photography is a hobby, but used only the automatic mode. I tried to learn from different articles in the past, but it confused me a lot and made to set with the auto mode. Now I am more interested to learn, presently having only a basic SLR from Olympus, giving some good shots only by luck, now I understand why. One clarification, what is focal length in mm and what photographers saying 100 mm lens etc. Are they same ? and how to choose it? Just my guess, the larger the mm, the good image of larger distance ? Can you please explain. One day you might be as good as me! Hey!!! Good Day! I recently bought my 1st ever cam with a manual setting which is the Fujifillm Finepix s4000 and I have been spending almost a week just to get the right adjustments. But thanks to your blog, it explained everything in laymans term.. I have a a question though, is my choice of buying this camera model a good choice or not?.. thanks and more power!! Thank you so much! I take product pictures of my handmade online hat business and cannot seam to get the pictures to not looked washed out or clear. I have searched high and low for a easy to understand step by step on dslr camera settings for my nikon and I also am a visual learner so your step by step instruction was perfect. Thank you!!! Improve Photography LLC is a participant in the Amazon Services LLC Associates Program, an affiliate advertising program designed to provide a means for sites to earn advertising fees by advertising and linking to Amazon.com. We also participate in affiliate programs with Bluehost, ClCJ, ShareASale, and other sites. We are compensated for referring traffic.